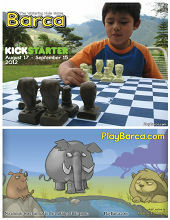 Barca needs your support right now on Kickstarter! While the travel version of Barca is very nice, people have been asking for a full color standard folding board version. So if enough people are interested then it’s going to be manufactured and become available for sale to the public. I think Barca has many wonderful qualities and apparently other people do too. 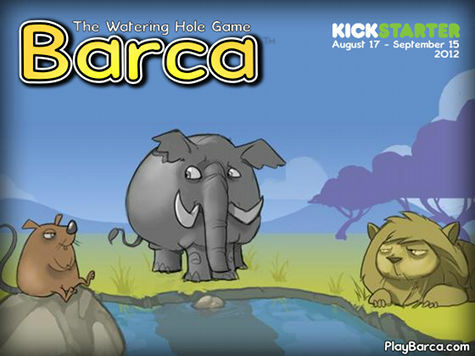 Please read some reviews of Barca at Board Game Geek. You could be one of those people who makes the difference by supporting Barca. Please visit Kickstarter and make that difference now. You want to help another way? Download the Barca Promotional Flyer, print it and post it. Thanks again! So you’re feeling nostalgic and want to have fun with an old school BASIC program. Or maybe you want to experience the old days of computing where you had to type in the game you played! Then break out that Apple II, Commodore 64 or emulator and you can enter Barca in BASIC. 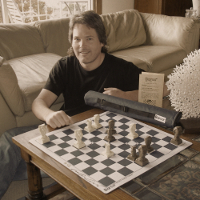 A good amount of work that I did making video games was programming them. It’s something I enjoy doing. Stumbling across an old BASIC programming book, “What To Do After You Hit Return or P.C.C.’s First Book of Computer Games” gave me the idea to write a Barca program in that fashion. The program was tested on my old Apple IIe computer. Although it was written in vanilla BASIC you may still may have to make changes to accommodate your computer’s flavor. 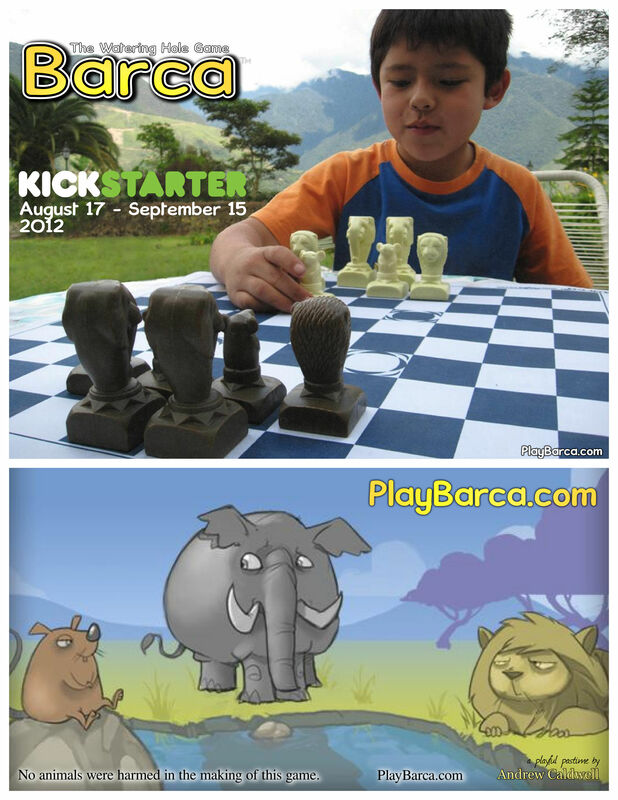 Barca in BASIC is a two human player game that displays the game in progress and enforces the rules. Don’t forget to save it to the tape or floppy drive! I’ll begin by saying this whole web logging (weB LOGging) is new to me. The idea that I write about myself is strange because I don’t think I’m important, I think I’m like everyone else. But I know that is wrong. Like everyone else, I am important. Without you, without me, what everyone does means little. It may mean something to them, but without other’s acknowledgment it means little if anything. I truly believe that all the good and bad we do to each other is all that really matters. And that’s where I’ll begin. In the short time getting this website up I’ve had people help me. Not only people I’ve known, but strangers. Not that they are strange, far from it, just people who are like me that I’m just getting to know. I feel lucky or blessed or whatever words one might use for these feelings. It is a good feeling. I hope everyone has this feeling sometime in their life. And when you do, the most important thing is to remember that feeling for two reasons. The first is that you may forget that you are important. You are here, you exist, that fact alone makes you important. The second is that you have an effect on others. Your words and actions carry weight to those around you whether you know them or not. Try to be good. It makes it better for everyone. That wasn’t much of a pitch for my game Barca. But the reason you can play Barca online is because of my brother-in-law, John Alvarado. He’s a golden (good old) friend of mine and a fan of Barca. And if you are lucky enough, he is one of the best people you could ever befriend. Barca is a fun board game that people enjoy playing. 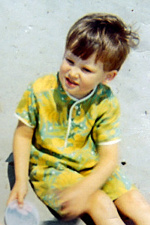 Andrew Caldwell is the person who created the game Barca. People who like Barca or Andrew Caldwell may like the other. That was dry, guess I’ll write more like I talk instead. The purpose of this website? To sell the game Barca by informing people of all things Barca. It seems people are more likely to support a product when they know the person behind it, hence this web log. To tell of this journey, still in progress, of bringing Barca to market. While writing this web log, I’ll be happy to answer any questions you have about Barca and of life. Though I would suggest the former as I have better knowledge of that. And if so inclined, you might learn some things about doing this yourself. Barca probably won’t change your life, but I will tell you how it has changed mine.